PeeS – Hey, I know this is some great art the peep created, but please don’t take it. That would be a copyright infringement now wouldn’t it? Yes. It. Would. That’s not cool. This entry was posted in Scotties, Scottish Terriers, Terriers, The Scottie Chronicles and tagged dogs, humor, Keep Calm, life, pets, Scotties. Bookmark the permalink. Sounds like a great mantra to us. Whee are going to piggy on over here though! Piggy on! Yes indeed. We’re together on this. That’s the best mantra that I have ever heard. You should be world leader. I’m headed that way…..you watch. OH…I’m arroooing right along with you! Sweet. ROOOOOOs to you and yours! Sounds like a good plan, only I’s changin it to Westie On for me. As you should my Whitley pal! Westie On. Back a’ cha my brother. aroooo!! sometimes it’s all we can do, brother in the beard! Yes, yes, yes! ArOOOOs to you and yours my Edgar pal. Sing my little song….Scottie On, Scottie On…. We shall do so. Arroooooooo! Sing Along with Stu this is. I try. Lord knows, I try. Love to you. That’s a very good idea. Sometimes, the peep lies down in the grass with me. At my level. So She can see what I see. From my perspective. We’ll just lie there together for a while. It’s pretty cool. That says it all, Stu! Trying to do my best. Love the graphic by your talented people. I do think it’s a nice likeness. Thank you! Yep, that so you Stuart! Rule on Stuart the Scott!!!! How I love to wear a crown. No pumps, though, just the crown. I’m a king after all. MOL MOL! Pumps are OUT for sure!!! Wasn’t that silly of me? OMD!! OMD!!! You did it!!! KING OF THE WORLD!!! YES!!! I bow to thy Highness…..
Only because of your support did I manage to capture the crown. And, yes, adult canine beverages are always welcome. AROOOOO! I dunno, y’all might arrooo much better than I! Wait, I confused myself. That comment didn’t make any sense. 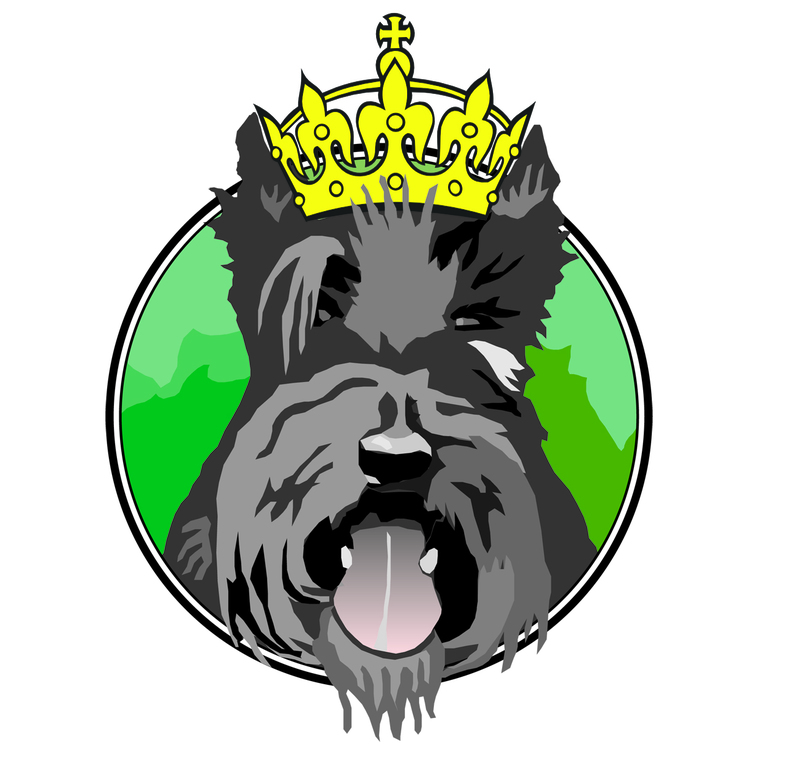 So here’s a new one: I dunno, y’all might look good in Scottie crowns, too. Wally and Sammy On. Woo Hoo Dalton buddy. Y’all stay safe over there. And Dalton On.